While the plum blossoms are beginning to burst open providing us with the encouraging SIGHTS and SMELLS of early spring, we have yet to hear the CALL, which in Japan has traditionally signalled the fact that spring has arrived in earnest — the cry of the male UGUISU (鶯), or bush warbler. The Japanese have long heard this distinctive chirp, which is actually a mating call, as HO-HOKEKYO (法　法華経), which also happens to be the name of one of Japanese Buddhism’s most famous sutras, The Lotus Sutra. Hear the actual sound here. The sudden appearance of this melodic expression of avian yearning has been an inspiration for some of Japan’s greatest spring poems, though the bird itself is quite plain, with dull brown feathers, and is in fact quite difficult to spot. A bird in the hand- Uguisu Mochi! 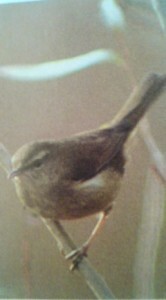 Since the Edo Period (1600-1868), the Japanese have anticipated the first calls of the bush warbler, which is often translated using the more poetic sounding NIGHTINGALE, by eating a traditional sweet (wagashi) called UGUISU MOCHI (鶯餅). 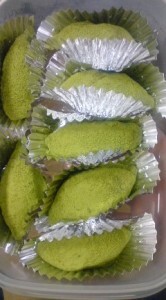 These are slightly oval-shaped rice cakes, sprinkled with green soy bean powder and filled with bean-paste, which are meant to suggest, rather abstractly, the birds of famous song. 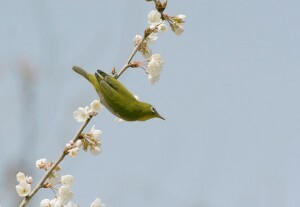 For me, it is ironic, however, that the green soy bean powder (in the Edo Period green tea powder was actually used), makes the sweets more reminiscent of the beautiful MEJIRO, or Japanese white-eye, than of the dull colored bush warbler. Since few people can actually recognize the UGUISU by sight, I guess that nobody takes note of this . 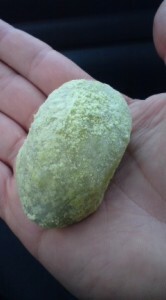 Uguisu Mochi will be on sale at WAGASHI SHOPS (traditional Japanese sweet shops) through mid-March. They can be bought individually, or as part of a set containing other early spring treats such as sakura mochi and yomogi mochi. This year I bought mine on the ground floor of Tsukuba’s Seibu department store at the HON-TAKASAGO-YA (本高砂屋) wagashi counter. There is one more point I’d like to make. In Japanese culture there are certain traditional pairings of flowers and birds — with one of these being UGUISU and PLUM BLOSSOMS (梅にうぐいす ume ni uguisu). Because of this, the bush warbler and plum tree are often depicted together as a spring motif in Japanese arts and crafts. 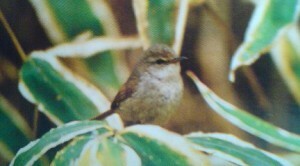 The fact is, however, that you will not very likely see UGUISU on a plum branch, as these shy birds usually remain within the shelter of bamboo groves and woods. Within the next few weeks, however, you are more than likely to hear their famous call. 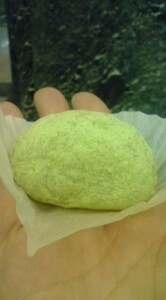 A fresh batch of UGUISU MOCHI- beautiful, delicious, and a sign of good things to come! 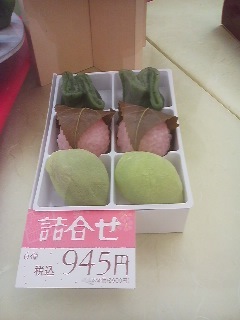 According to the season, some Japanese traditional sweets change!! We can have the feeling of Kisetsu-no-utsuroi (changing of seasons). Uguisu-mochi sound rather Shibui (literally bitter, but meaning something like chic, in French), and I enjoy it as I do sophisticated and charming company. .Avi-san `s photos nicely show the differece in color between the Uguisu and Mejiro. Like Yoshikiri, it is difficult to take photo of that Sopurano-singer. Another one and half month??!!. Momo, Sakura, Dango! 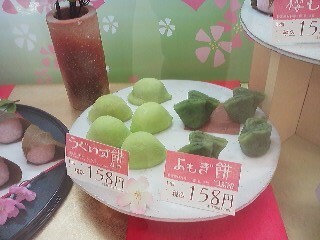 I like a Uguisu Mochi. When I was a senior high student, I did the tea ceremony. We enjoyed tea and seasonal sweets. This article reminded me of old fun days. Many young male birds can not　correctly sing “Ho- Ho- Kekyo” in early spring but sing something like Ho-Kyoku GumaKyoku or “Hottoite Okyure Kekkou” or “ Tokyo Tokkyo Kyokakyoku” . After months of training they can proudly sing “Ho—Hokekyo, Kekyo Kekyo Kekyo.Kekyo Kekyo Kekyo….” I am always amazed by the long singing line of their call that you can hear in June and July. That is the time for Ume-shu (Plum Liquor) making. And the time to taste one-year old Ume-shu, has come to be called Umeshu!=meaning delicious.